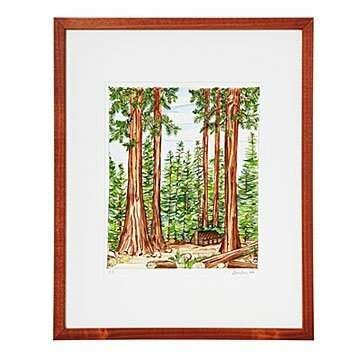 Spend every day among majestic redwoods with Renee Leone's vibrant watercolor landscape. Spend every day among majestic redwoods with Renee Leone's vibrant landscape painting. Featuring the West Coast's towering natural beauties, this piece is part of Renee's collection that creates a visual travel journal of iconic natural sceneries. Paired with a copper-toned poplar frame that complements this geographic composition, her signature geometric watercolor patterning captures not only the individual trees but also its surroundings, the mood, and the feeling of the region. Hand signed and numbered print in a limited edition of 250. Print made in Chicago. Frame made in the USA. Check out Renee Leone's other Regional Tree prints: Desert Cacti of the Southwest, Maples of the North Atlantic, Birches of New England and Aspens of the Rocky Mountains. Beautifully mounted and framed. Although a bit pricey. This picture is beautifully done. I love the majesty of the redwoods and I enjoy looking at this picture. I am very happy with my purchase.